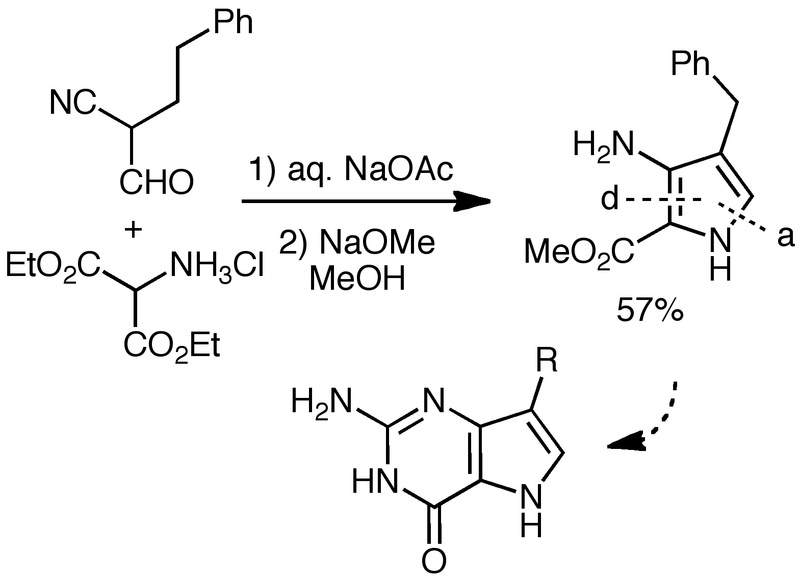 One lovely example of traditional Knorr synthesis is a condensation of omega-aminolevulinic acid NH2CH2COCH2CH2CO2H with 1,3-diketones. The aminolevulinic acid is surprisingly stable as a HCl salt, you mix it with a diketone in water, add sodium acetate and heat a little and beautiful flakes of substituted pyrrolepropionic acid snow out… I can do that every day, its so satisfying. Thanks, Milkshake, that’s a great tip. Do you have a reference you can share? I think the reference is Tetrahedron 49, 7017-26 (1993) but I cannot check it. The recipe is always the same: dissolve omega-aminolevulinic aci. HCl in water (5-10 ml per gram), add the 1,3-diketone or beta-ketoester 1 equivalent plus 2 equivalents of sodium (or potassium) acetate, reflux for 30 min to 4 hours (depending on the reactivity of the diketo partner), cool to room temp, filter the product, wash it with small portions of 30% ethanol in water on the Buchner funnel and dry. The purity should be pretty good without need recrystallization (if you are using unsubst 1,3-cyclohexadione check the purity, the commercial product is oftein gooey and partly oligomerized), with a very greasy 1,3-dicarbonyl partner that does not want to go to solution you can add some ethanol etc as a co-solvent. 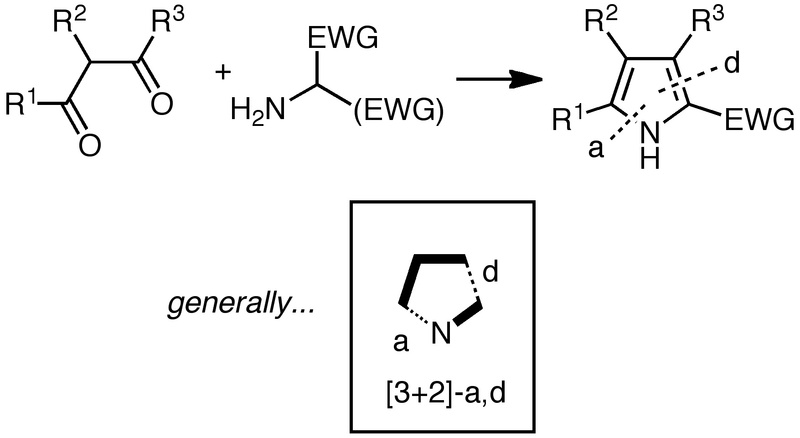 Unsymmetrical 1,3-diketo compounds condense the amino group of aminolevulinic acid preferentially to the less hindered/more reactive carbonyl group (so you get a good regioselectivity with acetoacetates and also with the isomer of dimedone 4,4-dimethyl-1,3-hexadione (the product is 5,5-dimethyl-4-keto-4,5,6,7-tetrahydroindole-3-propionic acid). Aminolevulinic acid from Aldrich is very expensive, I think we used to have it made for us by a custom synthesis contractor from omega bromolevulinic acid. 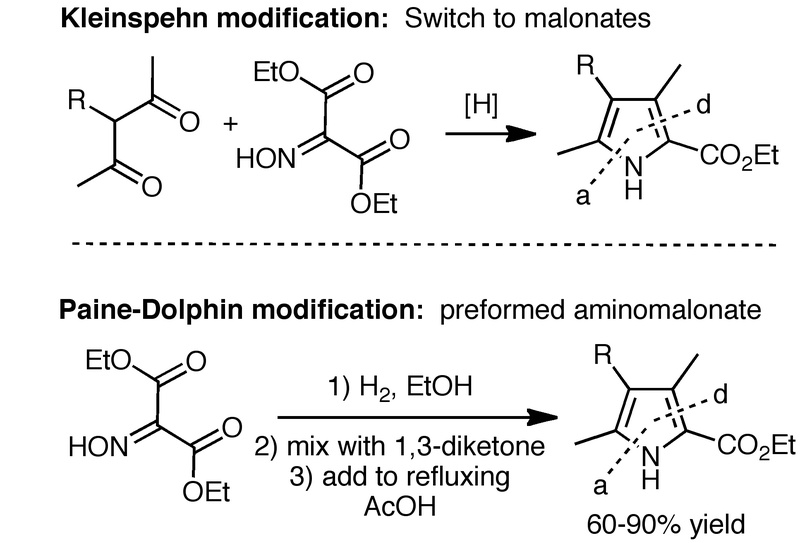 Also alpha amino acetophenones(HCl salt) work for this reaction, providing arylpyrroles byt the overal yields are only in the 50-60% range and the aminoacetophenones require 4-6 hours of reflux, depending on the aryl substitution. The aminoacetophenone precursors are easy to make (bromoacetophenone + urotropine, 2 days @ RT in chloroform, the urotroponium slat precipitates out and is hydrolyzed by dissolving it in a 2:1 mix of ethanol with conc. HCl and letting the mix crystallize over 2 days at RT, (The precipitate containing a crude aminoacetophenone.HCl is typically good enough to be used for the next step. Great information. 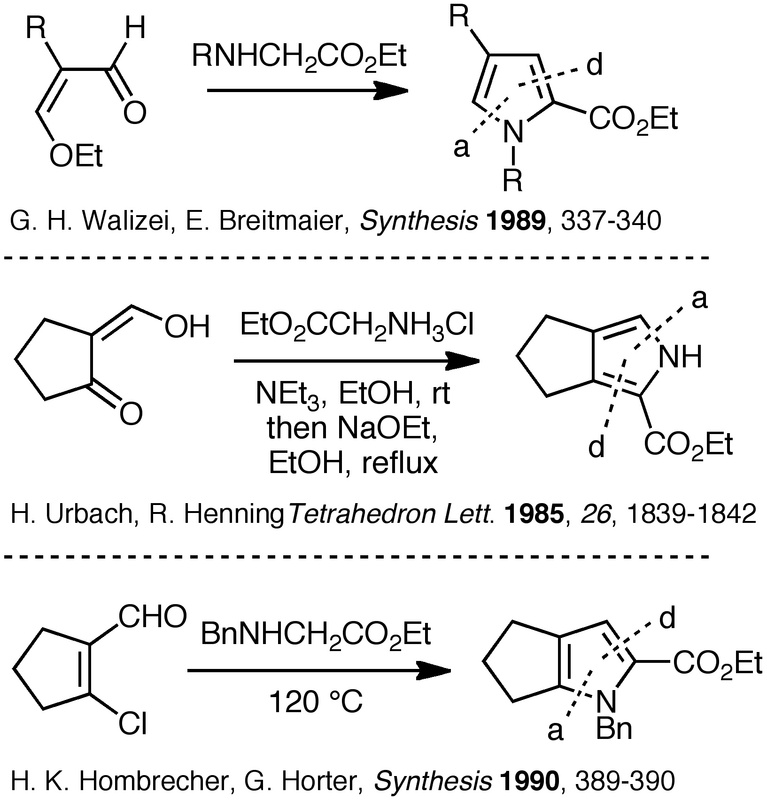 Here’s the key reference: “Reactions of some diketones with 5-aminolevulinic acid in acidic solution,” A. R. Butler and S. D. George, Tetrahedron 1993, 49, 7017-7026 (Link). 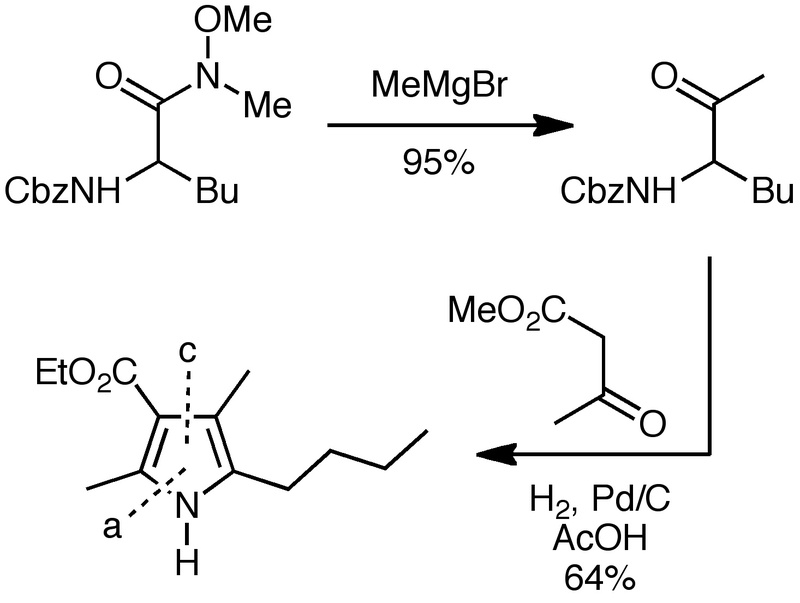 You can download a free copy of a later paper, “Some Reactions of 5-Aminolevulinic Acid with Cyclic beta-Diketones,” E. G. Brown and A. R. Butler, J. Chem. Res. (S) 1998, 458-459 (Link). 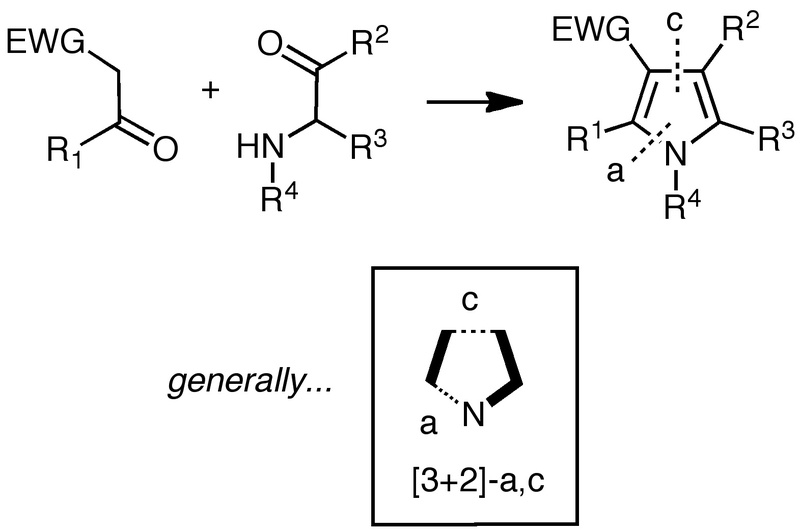 In the first paper, they generally got the Knorr connectivity, 3-acyl-4-(2′-carboxyethyl)pyrroles, but in other cases they got mixtures containing the Fischer-Fink connectivity, i.e., 2-(3′-carboxy-1-oxopropyl)pyrroles. 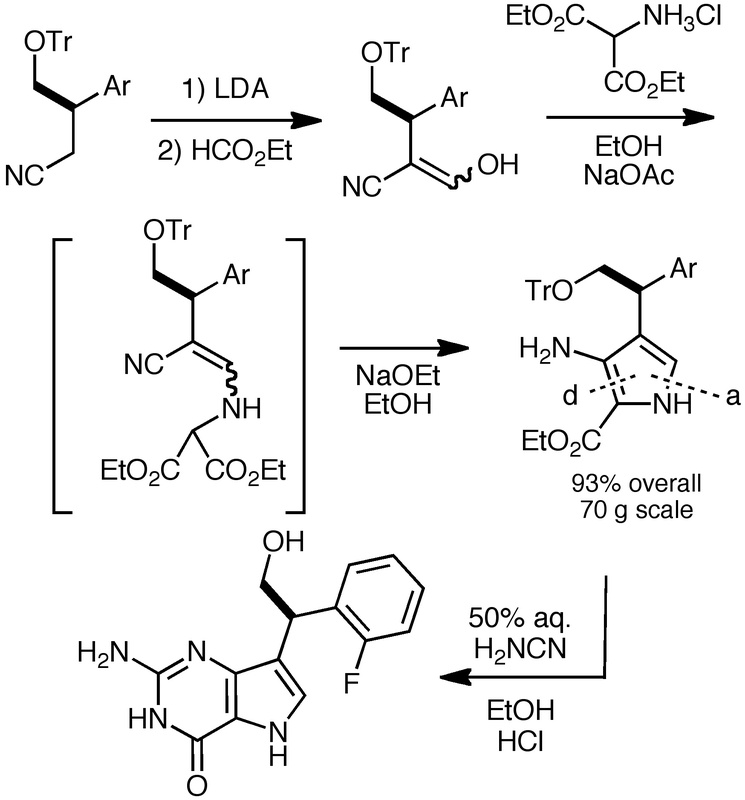 In the second paper, cyclic beta-diketones are used to make tetrahydroindol-4-one-3-propionic acids (the Knorr connectivity). John, thanks for your comments. I agree there’s much more that could be done with these descriptors. I use them extensively in my short course on Heterocyclic Chemistry, but only as an organizational tool, i.e., it’s a way to group heterocycle syntheses by the bonds that are formed in the key step(s). As such, it doesn’t attempt to classify reactions on the basis of mechanism or the timing of bond formation, but it certainly could. Nice idea! Thanks for stopping by with a valuable comment.